The human body is the physical or biological component of the human being. Although a single entity, it is made up of billions of smaller structures of four major kinds: cells, tissues, organs, and system. Humans are arguably the most complex organism on Earth. Billions of microscopic parts, each with its own identity, work together in an organized manner for the benefit of the total being. Such is the body that God has created for us. In Psalm 139, David declares his body is wonderful evidence of God's creative love. Its wonderful design serves to provide evidence of God's creative power and the love He has for us. Humans possess numerous specialized cells that perform unique jobs in the body. Shown are the red blood cells, Nerve cells, human egg cell, sperm cell, and cone cell of the eye. Cells are the smallest structures capable of maintaining life and reproducing, compose all living things, from single-celled plants to multibillion-celled animals. The human body, which is made up of numerous cells, begins as a single, newly fertilized cell. Almost all human cells are microscopic in size. To give you an idea how small a cell is, one average-sized adult body, according to one estimate, consists of 100 trillion cells! 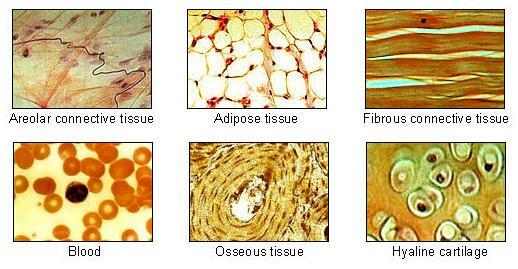 Tissue is a group of cells that have similar structure and that function together as a unit. A nonliving material, called the extracellular matrix, fills the spaces between the cells. This may be abundant in some tissues and minimal in others. The extracellular matrix may contain special substances such as salts and fibers that are unique to a specific tissue and gives that tissue distinctive characteristics. There are four main tissue types in the body: epithelial, connective, muscle, and nervous. Each is designed for specific functions. Epithelial tissues are widespread throughout the body. They form the covering of all body surfaces, line body cavities and hollow organs, and are the major tissue in glands. They perform a variety of functions that include protection, secretion, absorption, excretion, filtration, diffusion, and sensory reception. The cells in epithelial tissue are tightly packed together with very little extracellular matrix. Because the tissues form coverings and linings, the cells have one free surface that is not in contact with other cells. Opposite the free surface, the cells are attached to underlying connective tissue by a non-cellular basement membrane. This membrane is a mixture of carbohydrates and proteins secreted by the epithelial and connective tissue cells. Epithelial cells may be squamous, cuboidal, or columnar in shape and may be arranged in single or multiple layers. Simple cuboidal epithelium is found in glandular tissue and in the kidney tubules. Simple columnar epithelium lines the stomach and intestines. Pseudostratified columnar epithelium lines portions of the respiratory tract and some of the tubes of the male reproductive tract. Transitional epithelium can be distended or stretched. Glandular epithelium is specialized to produce and secrete substances. Connective tissues bind structures together, form a framework and support for organs and the body as a whole, store fat, transport substances, protect against disease, and help repair tissue damage. They occur throughout the body. Connective tissues are characterized by an abundance of extracellular matrix with relatively few cells. Connective tissue cells are able to reproduce but not as rapidly as epithelial cells. Most connective tissues have a good blood supply but some do not. Numerous cell types are found in connective tissue. Three of the most common are the fibroblast, macrophage, and mast cell. The types of connective tissue include loose connective tissue, adipose tissue, dense fibrous connective tissue, elastic connective tissue, cartilage, osseous tissue (bone), and blood. Nervous tissue is found in the brain, spinal cord, and nerves. It is responsible for coordinating and controlling many body activities. It stimulates muscle contraction, creates an awareness of the environment, and plays a major role in emotions, memory, and reasoning. To do all these things, cells in nervous tissue need to be able to communicate with each other by way of electrical nerve impulses. The cells in nervous tissue that generate and conduct impulses are called neurons or nerve cells. These cells have three principal parts: the dendrites, the cell body, and one axon. The main part of the cell, the part that carries on the general functions, is the cell body. Dendrites are extensions, or processes, of the cytoplasm that carry impulses to the cell body. 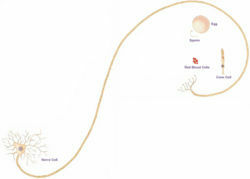 An extension or process called an axon carries impulses away from the cell body. ↑ 1.0 1.1 1.2 Introduction to the Human Body SEER Training Modules, National Cancer Institute. ↑ Cell Structure and Function SEER Training Modules, National Cancer Institute. ↑ Body Tissues SEER Training Modules, National Cancer Institute. ↑ 4.0 4.1 4.2 Epithelial Tissue SEER Training Modules, National Cancer Institute. ↑ 5.0 5.1 Connective Tissue SEER Training Modules, National Cancer Institute. ↑ 6.0 6.1 Muscle Tissue SEER Training Modules, National Cancer Institute. ↑ 7.0 7.1 Nervous Tissue SEER Training Modules, National Cancer Institute. This page was last modified on 3 March 2014, at 13:24.